When you are looking at buying a business, there are a lot of questions you will want answered. How much does the business make? What kind of numbers were on the last three years of tax returns? How much are the monthly lease payments? While the answers to these questions will be pivotal in helping you determine if a business fits with the goals you are trying to achieve, the more important questions will be the ones that go beneath the surface and delve into the motivations of the seller. The motivations of the person who has owned and operated this business (and now wishes to sell and move on) will speak volumes about the business and about the scenario you are about to put yourself in. This is part 1 of a two-part series addressing the motivational questions you should be asking sellers. Question 1: Why are they selling? There are two major reasons that someone sells a business.They want to move on, or they are abandoning a sinking ship. Sellers who wish to move on might be entering retirement or they may have their sights set on a different business venture. You might need to pay a premium price for a business where a seller is just looking to move on, but this motivation to sell has nothing to do with the business itself – it has more to do with the personal life of the seller. If you come across a business seller who is trying to get off of a sinking ship, don’t walk away just yet. Dig deeper to find out what the problems really are. If they are fixable, the current financial state of the business may mean you will be able to get a great price, but there will be an immediate need to implement changes that will turn the business around. Question 2: Will they agree to a non-compete clause? While this isn’t a common issue, as almost all purchase contracts contain a non-compete clause, you should be wary of a seller who refuses to offer a non-compete clause as part of the deal. Some sellers like their concept, but have decided to move the business to a different location. They try to sell the business, then open essentially the same business in a more desirable place. You don’t want to end up with a business in the wrong location or a business whose regular clientele will immediately follow the old owner to the new location. A non-compete clause is the best way a buyer can protect themselves from these issues. Question 3: Where did the listing price come from? This may seem like a straightforward question, but the answer will help you differentiate between a motivated seller and a seller who has no intention of selling. No intention of selling? Yes, it does occasionally happen that a seller gets pressure from family or elsewhere to put the business on the market – but they are so emotionally attached to the business that no amount of money will be enough to get the deal done. Asking a seller how they came up with the listing price will speak volumes about how realistic this seller will be throughout the process. Are you a business buyer who wants to know what kinds of questions to ask sellers? Do you have additional questions about what kinds of answers you should be looking for? Ask us! Please feel free to leave us a comment or question here, and we would be happy to assist you with your business buying questions. Start a New Franchise, Or Buy Existing? If you’ve decided that a franchise is for you, the next decision will be whether you should build your own new franchise location or buy an existing franchise. How do you decide what’s best for you? Let’s look at the two options. If you are leaning towards starting a new franchise location, then one of the possible benefits you can expect is choosing your own location. You will not have to worry about the reputation the business gained (good or bad) under previous ownership as the slate is clean. You will get to make all key decisions in terms of location, staff, and (depending on the franchise) design. Another big plus? Everything will be new, from the furniture and equipment to the attitudes of the staff. You won’t have to contend with aging equipment or burned out employees. There are, however, big downsides to starting a new franchise location. The biggest is the cost. Around 90% of the time it will be far more expensive to start a new franchise location that it would be to buy an existing location. Why? Not only do you have the costs associated with any start-up business (like build out, furnishings, equipment, permitting, licensing and the like), you will also have a set of franchise fees you will need to pay. It will be far less expensive to buy an existing franchise location and then pay the associated franchise transfer fees. Another big bonus of buying existing is you are buying a proven location. New locations always come with the added risk that the location won’t support enough business to keep the doors open. Systems and staff are already in place and the equipment and furnishings that are in place are there because they work and have proven to be necessary. You are also buying an existing customer base, who already knows you are there and what to expect. For most future franchisees, it is a far better bet to find and buy an already existing location instead of trying to start a new location from scratch. The risks and costs involved will be far fewer with a proven business. Are you thinking about buying or starting a franchise, but you have more questions? Please feel free to leave us a comment or question here, and we would be happy to help. You might be one of the best in your field. You’ve taken a small business and created a stunning success. What you are not, however, is a business sales expert. When the time has come to put your business on the market, you might think that selling your business will be far easier than running your business on a day to day basis. It isn’t. If you are considering selling your business, there are a few common misconceptions that you will need to banish from your mind if you hope to have a successful sale. These misconceptions derail many business sales simply because business sellers get hung up on what they think the experience of selling their business should be like instead of embracing the reality of what it will be like. My business can sell as-is. No, it can’t. It takes a lot of work to get a business ready for the market. Think about selling a house. You get the carpets cleaned, repaint all the walls, get the landscaping done and stage the house with furnishings. You business will need the same kind of once-over too. You will need to reorganize your financial records to make them easy for a buyer to read and understand, you will need to collect any necessary documentation like contracts, leases and the like, and you will need to make any necessary repairs. A good thorough cleaning never hurts either. The point is, you only get one chance for a first impression with buyers, so help your business be at its very best. Buyers will beat down my door. No, they probably won’t. Yes, it has happened that a business went on the market and sold almost immediately, but that is the exception rather than the rule. In most cases, it takes around 9 to 12 months to get a business from listing to closing, but in the business market every situation is different. Once your business is listed on the market, it will take time to find the right kind of buyer, get through the negotiations and complete due diligence. Patience is the key. My listing price is so good, there will be a huge bidding war. Again, no. Many business sellers see their business as an extension of their life, and therefore don’t see their business very objectively. Sure, you would pay whatever you want for your business, but that’s not who’s buying. Buyers are going to be taking a very objective look at something that means a lot to you, and almost always your listing price ends up as a starting point for negotiations rather than a final sale price. The full-price, all-cash offer is extremely rare. What else is rare? Bidding wars. While it does occasionally happen that a business will generate more than one simultaneous offer from buyers, it is far more common for a seller to negotiate with only one buyer at a a time. If this buyer won’t pay me my full listing price, I can wait. I’ll get more for my business next time. Yes, this one is probably wrong too. Timing is everything in business sales, so sellers who walk away from great buyers making a very fair offer will likely have trouble finding another buyer who is willing to pay more. Treat every offer, no matter how ridiculous you think it is, as a starting point for negotiations. You (hopefully) didn’t list your business for the exact amount you are willing to take. Likewise, most buyers will come in lower than their final number to see where the negotiations take them. I only want an all-cash offer. I will accept nothing less. Well, then you probably will have a really tough time getting your business sold. Sure, the economy is worlds better than it was a handful of years ago, but that doesn’t mean that it is easy for buyers to come up with very large sums of cash or find some kind of traditional financing. Most deals involve some seller financing, and by agreeing to offer seller financing to the right buyer – you will put your business ahead of those sellers who won’t. The prevailing theme with all of these misconceptions? A good hearty dose of reality. If you enter the business market with a realistic attitude and some professional help (like a business broker) by your side, you will have a far greater chance of success. Are you a business seller who is ready to enter the market, but you have questions about what the process will really be like? Please feel free to leave us a comment or question here, and we would be happy to help. Although well-known oversees, the term EMV is not so well known to U.S. markets. That will surely change in 2015 as the United States catches up to the rest of the modern world with the requirement of Electronic Chip Card technology also known as Smartcard. The savvy business owner will be in front of this change and ready to take advantage of the benefits associated with this new technology. Compared to the current technology come to be known as “swipe and sign”, a chip is extremely difficult to crack; card authentication and PIN verification are performed automatically and objectively by the chip raising the level of transaction security tenfold. What does all of this mean to the business owner who relies on credit card purchases? In October 2015 U.S. credit card companies will fully embrace the chip technology. Merchants will be required to have equipment that will read and accept the new cards. Currently, banks are responsible for any credit card fraud that may occur. With this new liability shift, merchants who have not upgraded their point of sale equipment to process transactions made via Chip and Pin will be responsible if fraud should occur on that card. Although magnetic stripe cards will still operate, the transition to chip cards will be quick and merchants will want to be ahead of the demand. Guest Contributor: EFFECTIVE TEAM LEADERSHIP: DO YOU CELEBRATE YOUR WINS? Do you take the time to recognize and celebrate your wins? Are you doing something special to show your appreciation for your staff’s efforts when a goal is achieved? Or do you find yourself caught up in the everyday toil of focusing on the next thing that needs to get done. In our modern day business culture of non-stop work effort it far too easy to become attached to the next upcoming task on our list instead of stopping to reflect and celebrate on success that had just been achieved. Recently there have been several studies that have revealed a number of reasons why we should honor our team’s efforts with an acknowledgment of appreciation. Here are six reasons why celebrating “wins” can greatly impact your company’s success. When employees feel appreciated they are more willing to offer creative suggestions to improve business practices, increase production or improve client relations. They begin to take on an attitude of ownership and see projects through towards there successful completion and are more willing to put in the extra effort it takes to achieve the companies goals. 2. It Adds an Element of FUN ! 3. Builds Momentum towards even Bigger Goals! When human behavior is recognized and rewarded we tend to be conditioned to strive for bigger and greater outcomes. Companies such as Apple and Google are great examples of how to time and time again they exceed the world’s expectations though huge strides in technological advancements. They are also both great examples and believers in implementing programs that recognize and reward employee teams for achieving or surpassing their objectives. They have found the team award has had a far greater positive effect than just recognizing only one outstanding employee. Strong motivated happy teams build ever-increasing company success! Have you walked in a place and felt good to be there? Perhaps, you sensed the positive attitudes of the people who worked there. Maybe, you found that they treated you and other customers with love, kindness and the type of customer service that truly showed how much they loved their job. Numerous studies have shown that happy employees results in happy customers (and happy customers are more likely to come back and refer their friends too). When the team is excitedly involved in reaching the goal together, they are more willing to participate and help each other in a positive way. A motivated team will generally achieve most goals quicker than individuals who work separate goals that are unconnected to the main team’s objective. One of my clients who owns and operates a custom signage and graphics business recently adopted a simple and effective program for honoring his employee team when a monthly goal is reached. At the beginning of each month the team comes together to talk about how they are going to work together to achieve that particular months sales goal. Together and along with the owner they come up with a reasonable, simple and fun way to honor and celebrate if the goal becomes achieved. Ideas have ranged from free pizza for lunch, to gift cards for each employee, to throwing a company picnic. Once the particular method of future goal celebration is agreed upon it becomes a fun and exciting game in which all participate fully to achieving. So far he has found that since introducing and implementing this method of pre-planning the celebration, every monthly goal has either been achieved or greatly surpassed. My client had also remarked that these simple celebrations have added a renewed spirit of fun and enjoyment to his business which had previously been lacking. Regardless of how you want to implement a moment of celebration is actually less important than actually doing it. The truth is in this somewhat crazy fast paced world we sometimes forget to stop and actually recognize our own successes or our team’s successes. Whether you recognize your team’s achievement by picking up the lunch tab at their favorite eatery, providing a financial bonus reward or simply letting out a Michael Phelps style primordial scream and then praising everyone for a job well done… the benefits of celebrating and expressing gratitude far outweigh the effects of unrecognized achievement. Buyer & Seller: How Should You Handle Employees? This without a doubt is the most discussed portion of purchasing a business. The sale of any business that has employees (especially those with critical “key employees”) will need to be handled carefully. As a buyer, do you require that you meet with key employees as you feel they are critical to the business? As a seller, do you let this happen? What if the buyer walks away or approaches the employees the wrong way? From my experience the seller typically feels that the employees are loyal to them, but will then reassure the buyer that they will stay without any issues. Well, 50% of that statement is typically true. The employees many times will view a new owner as a positive, especially if it is handled properly. Long term businesses often become stale as sales efforts and marketing may have been decreased or become non-existent leaving the business just gliding. A new owner can bring that new energy, marketing ideas, bring in additional employees, new clients and just a new way of doing things which can invigorate a business and push it to the next level. One of the reasons why you do not tell employees too early is most of the time the employees really do want or need to keep their job. Telling employees too soon will bring out their insecurities leaving them wondering if they will have a job after the sale closes, if they will be replaced, will they get along with a new owner… and this will lead to an employee vacating which is not good for either side. As a buyer, you should wait until after the sale to tell the employees. When told after a sale, a new owner should go in very optimistic when meeting with the employees, make sure no major changes are planned, set expectations and the direction of the company and make sure the seller gives proper support. Employees want job security, and the best way to make sure you can give that is if they are there after closing. If the business has been stagnant and on cruise control, a new owner can bring not only the excitement, but it may also bring new opportunities for employee advancement. This is especially true if the business is being acquired by a larger firm or if the business is ripe for expansion. The employee mind set is not always what a buyer or seller feels it will be, and many times the loyalty of employees is to the company or their job and not necessarily to the seller. From my experience there are many more negative things that could happen by dealing with the employees prior to a sale rather than after. You will not have them looking for new jobs, you do not have to worry that clients/customers are aware of the sale and if something incorrect is said you do not want that costing you a sale. Instead, focus on giving constant and honest communication, open up and ask for input about what the company can do better, be clear on their roles, the eagerness to build the business and make sure it is known that they are being counted on. Hopefully that will build confidence and loyalty on both sides, thereby creating a positive environment. Although there are many reasons to use a business broker, I will focus on just a few of the main reasons from my personal experience. This is Part 1 of a two-part series that will address the reasons you need a qualified professional by your side. Unfortunately finding buyers is not as simple as putting an advertisement out there. There are many moving parts and it can be very time consuming. Many times there are one or more attorneys involved, a CPA, family or financial partners – and showing all parties the information they want to see and satisfying all sides is not exactly easy. As an established business broker we already have a huge database of qualified buyers. Within this database of buyers we have already taken the time to go over financials, goals, types of businesses, nuances in certain businesses…we know exactly who to send a business to immediately. Our extensive marketing is able to target specific buyers using direct email campaigns, providing access to other qualified business brokers and their buyers, as well as canvassing CPAs and attorneys and their buyers. This gives a seller the great advantage of increasing the probability of finding a good qualified buyer, which in turn can maximize the value of your business. If I was estimating, I would say only one out of every 30-50 prospects is a qualified buyer for any particular business. Don’t try to wade through all those buyers alone, use our help instead. I have a client that is trying to squeeze as much value out of their business as possible, and I can definitely understand and appreciate that as I would do the same. The issue is they are inquiring with many appraisers and brokers – basically they are looking for what they want to hear. My personal valuation was within 5% of an appraisal (mine was actually higher). There are brokers out there who will tell you what you want to hear, and there are also many tools that you will be able to manipulate to get to the valuation that you are looking for. Try to remember that the objective of a business valuation will be to properly price the business to get in the range that will generate interest from buyers. There will always be a difference of opinion on value, but from our experience when we are within 20% of value vs. asking we have had much greater success than when over the 10-20% range. When putting an evaluation together we have different valuation models, we have current market knowledge of what is selling, trends, time frames and more. We also have access to thousands of sold businesses to complete a proper valuation. It is not as simple as inputting a few numbers. It takes a full, comprehensive look at the business to develop an appropriate number. Anyone that gives you a value off the cuff or has a simple mathematical formula – these are not going to be very accurate. Want to read The 4 Big Reasons You Should Use A Business Broker, Part 2? Click here. WANT TO WORK WITH ONE OF THE BEST BUSINESS BROKERS IN ALL OF FLORIDA? 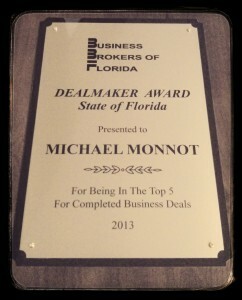 Work with one of the best business brokers in all of Florida! 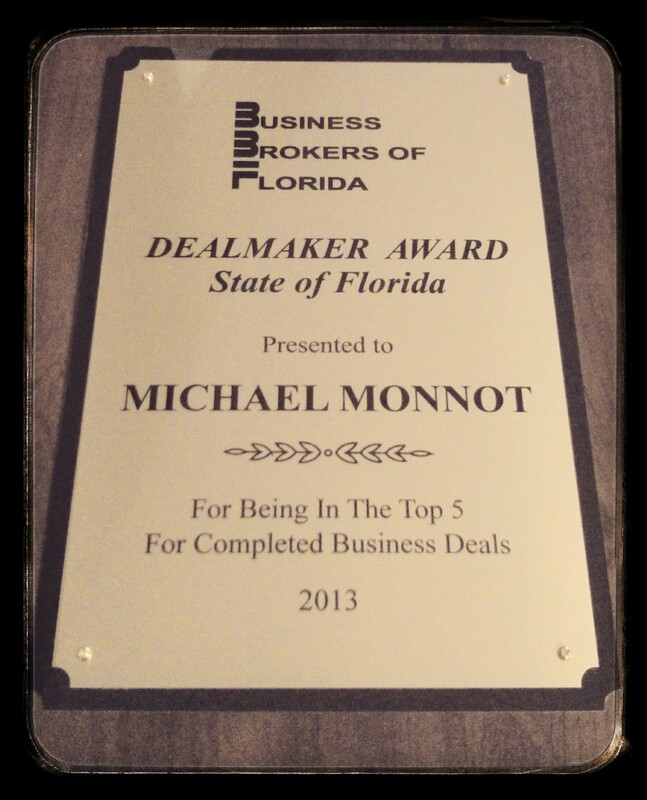 DEALMAKER AWARD – Top 5 For Completed Business Deals in the state of Florida for 2013! Demand excellence, work with us today! We’ve been there. It’s what feels like (or maybe actually is) the 90th hour you’ve worked that week, and you are so burned out with everything that it takes to run your business that you are actually entertaining the idea of closing the doors and finding a regular 9-to-5 job – tomorrow. Punching the clock for someone else seems like a dream. The reality is you are an entrepreneur at heart. You have to be. You have driven your business into what it is today. A 9-to-5 job might be a relief at first, but the very first time you have to do something you think is ridiculous, simply because management told you to do so – you’ll instantly regret leaving business ownership. What to do then, when the monotony of having to go into your business and do the same thing everyday has become too much? Sell your business and reinvest! A large number of the business sellers we work with come back looking to buy another business. When it’s the entrepreneurial spirit that drives you, you can’t go back to 9-to-5. If monotony has you down, sometimes all you need is a change of pace. You can even look within your own industry. If you now own a decent sized fine dining restaurant, then maybe a small cafe might be a good fit because of all your years of experience – but without the same workload or levels of responsibility. The change of pace might do you well. Perhaps the thought of buying another business in the same industry sounds like a terrible idea. What you might need is another industry altogether. Say you’ve owned your own insurance agency for years, but you spent several years of your youth working in an auto shop – and you daydream about a business in the auto industry. As long as the industry you are trying to enter is one where you have some level of knowledge or practical experience, the move to another industry may suit you. Brought up in mom or dad’s business, but your true passion lies elsewhere? Family businesses typically get passed down to the next generation, but the next generation may not have the same passion for the industry that their parents did. Continue your parent’s entrepreneurial legacy while simultaneously following your own path by selling the business. Use the capital to invest in a different venture that will get you jumping out of bed in the morning. Are you tired of your business, but the thought of returning to working for someone else isn’t pleasant? Would you like to know what types of businesses would be available to you if you sold the one you have now? Ask us! Please leave us a comment or question here, and we will be happy to help. Once a business is listed on the market, it will hopefully bring in at least a few offers. Once you receive an offer, you will have the choice to accept the offer, or you may choose to negotiate for a different price. Once you get to a price you are comfortable with, you will accept that buyer’s offer. After the closing documents have been signed, congratulations – you sold your business! What to do next? Click here for ideas…Business Sellers: I Just Sold My Business, What Comes After the Closing Table? Are you thinking about selling your business, but you have questions about the process? Please feel free to leave us a question or comment here, and we would be happy to further explain the process.